Dave & Inge Down Under: The Race that stops the nation.. 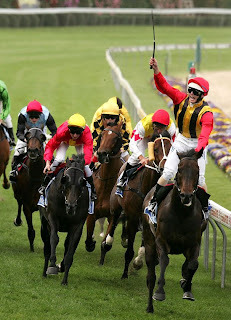 Tomorrow is Melbourne Cup Day, which is as they say "The race that stops the nation"
This country is obsessed by sporting fixtures and this is the biggest on the calendar, like the Grand National horserace in England only about 10 times bigger. Everyone has a bet and god knows how much is fluttered away on the horses.